Ready for a simple update to your house that will make it look refreshed and brand new? Removing or replacing old wood paneling can be a low-cost way to do the trick. But there are some pitfalls to be aware of that could not only impact the price, but the amount of effort required. To help you ditch the wood-look, we spoke with Julian Pastin, Store Director at Rebuilding Exchange. What’s the Cost to Remove Wood Paneling? Typically, removing wood paneling is a low-cost project, and could be as cheap as the tools you use. However, the cost can vary based on the type of paneling you’re dealing with and whether it’s attached to drywall or nailed directly to studs. Cost Factor 1: What Type of Wood Paneling Do You Have? 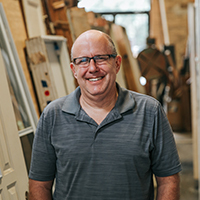 Pastin says that the three most common types of panels are shipboard (also called shiplap), tongue-and-groove and barn siding. Each have different characteristics and are attached to the wall in different ways, which can affect your removal costs. Panel glue tends to be more expensive, as the risk of damage to the surface beneath the panels is greater. Very common in houses from the 1970s-80s. Size of panels vary, but typically 4x8 sheets. Tend to have a pattern embossed on the front. Tends to be the cheapest to remove. Comes in varying widths, typically 6-8 inches wide. Lock together along the length of a wall. Think of the knotty pine you would see in a log cabin. Thicker piece of plywood that typically has some grooves in it. Manufactured to be used on the outside, but can be used inside as well. Cost Factor 2: What Is Behind Your Wood Paneling and How Is it Attached? Removal is easiest when the panels are attached with nails. If the planks are attached with paneling glue, you run the risk of damaging the drywall, leading to increased costs. When panels are nailed directly to the studs, the cost of removing the paneling will go up as new drywall will need to be installed afterwards. Pastin notes that this is most likely to happen with barn siding because it is a heavier style of panel. Inexperienced DIYers may want to consider hiring a contractor for drywall installation. As with any project, make sure you have the right equipment beforehand. Here’s a quick list of the tools you’ll need no matter what, plus a few more recommendations depending on what is behind the wood paneling. The best disposal option depends on the amount of wood you’re tossing. If you’re removing panels from one small bedroom, you may be able to throw it out in your weekly trash. For larger areas like a basement or multiple rooms, renting a roll off container is often the most convenient option. Typically, a 10 yard dumpster will do the trick for one room, but if you’re removing wood paneling from a bigger space, it’s usually best to use a 20 yard dumpster instead. 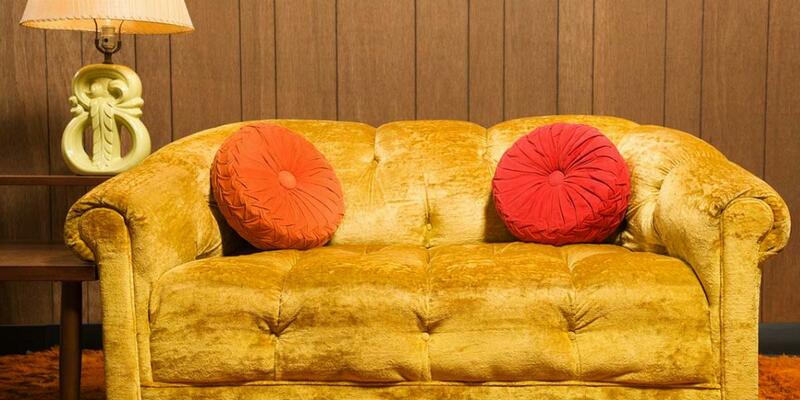 You’re trying to make your walls look great, but don’t mess up your furniture in the process. Consider removing smaller items from the room, and covering larger ones with a blanket or tarp. Remember, there’s a good chance you’ll kick up a lot of dust. Before you dive in, you’ll need to remove any baseboards or molding, and light switch or outlet covers around the wood panels. Use caution and store them in a safe place, as you will probably want to reinstall them after the wood panels are off the walls. Insert your screwdriver between the baseboard or molding and the paneling. Gently pry until there is a bit of wiggle room. Remove any nails using your pliers once they are exposed. Once all of the nails are removed, slide the baseboard and molding away from the wall and set aside for later use. Unscrew and remove any outlet or light switch covers that need to be removed. Pro-Tip: Start at the corner of a room to help avoid splitting any of the molding. Also, if you feel resistance when sliding the baseboard or molding out, check to make sure there are no nails you missed. The moment of truth. Is there drywall behind your wood panels, or just studs? And if it is drywall, how is it attached — knowing this will determine which steps you need to follow moving forward. Start in a corner near the floor, and use a hammer to gently tap your pry bar into the seam where the walls meet. Loosen the panel by gently wiggling the pry bar. Remove any nails that come loose. (Helpful hint: if there are no nails on the wall, your panels are most likely glued to dry wall). Pry the panel back slowly to determine if the paneling is attached to drywall or wall studs. If it is drywall, you can tell if it is attached with nails or glue fairly easily. “If it’s very difficult to get a pry bar under there or it won’t pull out at all once you do, it’s most likely glued,” Pastin says. Now that you know if you have drywall or wall studs to work with, you can let the fun begin by removing the panels. These general steps apply to all three types of paneling, but knowing which type you’re working with is very important. “With tongue and groove, it’s easier if you pry up the tongue side first,” Pastin says. “The other types don’t matter as much what side you’re working with. No matter what, going slow is key if you want to keep the wood intact." Pry back the panel using your pry bar and hammer. Remove nails with pliers as they come loose. Remove the panel from the wall after all nails are out. Place panels in a pile away from the project, or dispose of them in your dumpster. Repeat until all panels have been removed. Patch nail holes in wall studs with drywall putty. Install drywall over exposed wall studs if necessary. Pro-Tip: While this is a quick job, be careful not to damage the wall studs by moving too fast or recklessly. Pry back the first panel using your pry bar and hammer. Remove all nails with pliers as they come loose. Continue until all nails in a panel are removed, then ease the panel off of the drywall using your pry bar. Use either your chisel or pry bar to loosen panels around the removed one by wedging the tool between the wood panel and drywall. Repeat steps 1-3. Toss removed panels in your garbage bin or dumpster. Patch nail holes and any damaged drywall with drywall putty. Find a seam between two panels. Use your chisel and hammer to pry as much of the panel up as possible without damaging the drywall. Starting at the lowest setting, hold your heat gun about six inches away and aim at the section of paneling that has been lifted. Keep moving the heat gun around the opening to avoid burns to the panel. Pry the panel off as the glue softens while continuing to move the heat gun. Grab the panel with your hand once you have it removed enough and continue to apply heat as you lift the panel off. Scrape soft glue residue off the drywall with your chisel once the panel is off. If the glue has hardened, use the heat gun to re-soften the glue. Throw the removed panels in your trash bin or dumpster. Remove any remaining glue residue on the drywall with either the heat gun and chisel or sandpaper. Patch any wall damage with drywall putty. Not Sure If Removing the Panels Is Right for You? There are other options to mask or even repurpose those panels without taking them off the wall. Pastin and Chris Camp with The Painting Company offer a few tricks to updating the wood without removing it. Sometimes a simple coat of paint can go a long way in making a difference. Camp says painting wood panels is an easy task when done properly. Camp offered a simple four-step guide to painting old wood panels. He recommends a minimum of two days for the project, no matter how big or small the room is, to allow enough drying time. Sand the panels to remove the polyurethane or clear-coat sealer. Apply primer to the panels. Paint the panels — typically with two coats. According to Camp, a proper sanding and picking the right primer are the most important steps. If not properly sanded, the paint can peel back. And without a good primer, the paint may not apply as well. Pastin notes that some people may opt to simply cover up the paneling with wallpaper. He suggests a product called wallpaper liner, which you can find at most major home improvement stores. Be creative. Pastin said that he has seen people use the panels to their advantage, such as taking a bookcase without a back and putting it against the paneling so that it appears the wood is the back of the bookshelf. With the panels off, your walls now have endless possibilities. Maybe it’s time to display those family photos you’ve been wanting to hang up. Maybe you can paint the walls to change the vibe of the room. The choices are all yours. Have fun, knowing you put in the work to make the walls your own. Interested in other projects that will modernize your space? 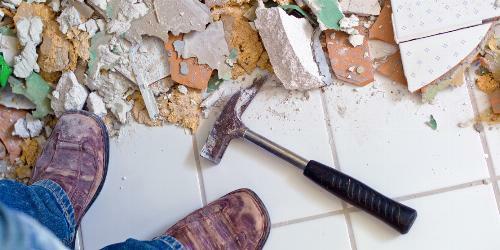 Check out our suggestions for other home renovations projects that add to the value of your home. Installing bathroom tile yourself is the best way to cut project costs. Tackle this ambitious weekend DIY project with tips from the pros. 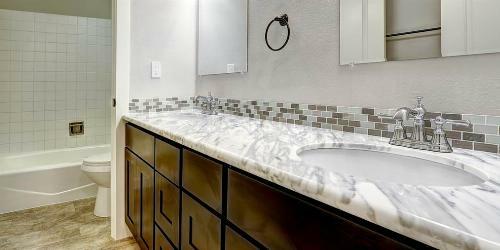 Whether your vanity is cursed with too little counter space, suffers from cramped storage or is still begging for mint green tile to come back in style, replacing it should be in your bathroom remodeling plans.